Raul Medina's vegan taco cart. Among the things that people associate with Oakland’s Fruitvale district — the taco trucks, the bustling Mexican markets, the grassroots activism — veganism probably wouldn’t rank too high on anyone’s list. Oakland Veg Week, The Town’s annual celebration of plant-based eating, aims to change that. The festival will kick off an entire week of meatless merrymaking on Sunday, May 15 with “Domingo Delicioso,” a mostly Spanish-language outreach event hosted by the Fruitvale-San Antonio Senior Center, just steps away from the Fruitvale BART station (1–5 p.m. at 3301 E. 12th St., Ste. 201). According to Oakland Veg Week organizer Katie Cantrell, it’s for good reason that the five-year-old festival is holding an event in the heavily Latino Fruitvale neighborhood for the first time this year: Latinos are a demographic that vegan activists have largely overlooked. Indeed, the vegan food movement has occasionally suffered from the perception that the lifestyle it promotes is largely the purview of wealthy and middle-class whites. To combat that stereotype, for the past couple of years Cantrell and her co-organizers have made a concerted effort to use Oakland Veg Week as a platform to spread the vegan gospel to a more diverse audience — in other words, to show that veganism isn’t just for white folks. So, last year’s itinerary prominently featured a vegan soul food event and a hip-hop-themed dinner catered by a local Cameroonian chef. This year, the festival turns its attention to Oakland’s large Latino population with Domingo Delicioso. The free event will have a broad focus on the intersection between veganism and Latino social justice issues, Cantrell said. Guest speakers will include Antonio Magana — the chef-owner of Flacos, the Berkeley-based vegan Mexican restaurant and farmers’ market stand — and Lauren Ornelas, who founded the Food Empowerment Project, a vegan food justice organization that advocates for the improvement of farm conditions for both animals and workers. Attendees will be able to snag some free produce, as well as all of the information they ever wanted about the health benefits of giving up meat. But if convincing Latinos to become vegan — or, at the very least, to reduce their meat consumption — is the goal, then the best way to do it is probably through their stomachs. 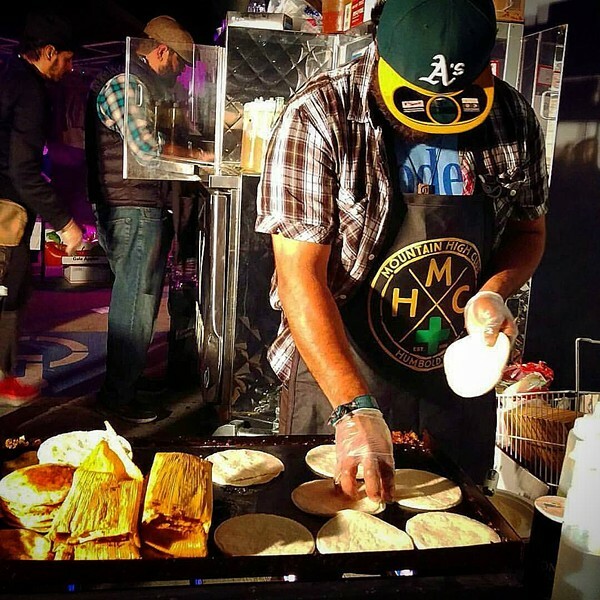 At Domingo Delicioso, that responsibility will largely fall upon Raul Medina, the proprietor of Taqueria La Venganza, an Oakland-based vegan taco pop-up, which will be the main food vendor for the event. Medina said he gave up eating meat shortly after living on his grandmother’s ranch in the northern Mexico for two years when he was a teenager, when it was his job to kill the chickens. But if he’s going to convince Fruitvale residents to give veganism a try — at least for one day — he’ll have to show them that the food can be delicious. Medina believes he’s up to that task. He explained that he conceived Taqueria La Venganza to be exactly like the kind of taco cart that you’d find in his ancestral homeland of Durango, Mexico — just without the meat. He presses the tortillas by hand and makes all of his salsas from scratch. Perhaps most importantly, Medina said he tries to offer every standard menu item that a customer would find at a traditional taqueria: the carnitas, the carne asada, and the al pastor. Instead of using seitan, which seems to be every vegan restaurant’s stock-in-trade, Medina makes all of his “meats” using yuba (aka tofu skin). For Sunday’s Domingo Delicioso pop-up, he plans to offer a lineup of Mexican comfort food. In addition to his usual lineup of tacos, he’ll also sell two different kinds of potato-filled gorditas and a variety of steamed tacos al vapor. 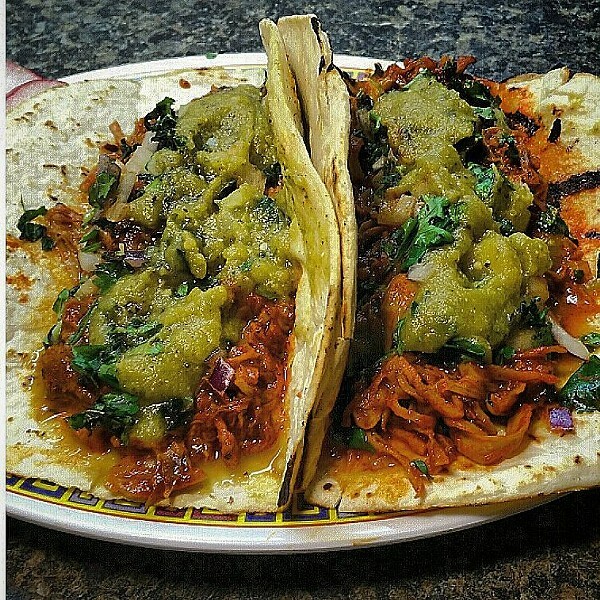 Of course, Domingo Delicioso is just the start of this year’s Veg Week festivities. Other highlights include a vegan tech forum on Tuesday, May 17, that should appeal to anyone interested in the cutting-edge work that’s being done in the fake-cheese and fake-meat sectors, and a vegan film festival at the New Parkway Theater on Thursday, May 19 — the lineup includes a documentary about a 78-year-old vegan bodybuilder and a Lithuanian short film about people who form friendships with turkeys. You can find the full itinerary on OaklandVeg.com.